Somerville’s down-to-earth commentary helps “lazy environmentalists” get back to earth the DIY way. Green living meets household management without the tension and one-upmanship often found in environmental discussions. 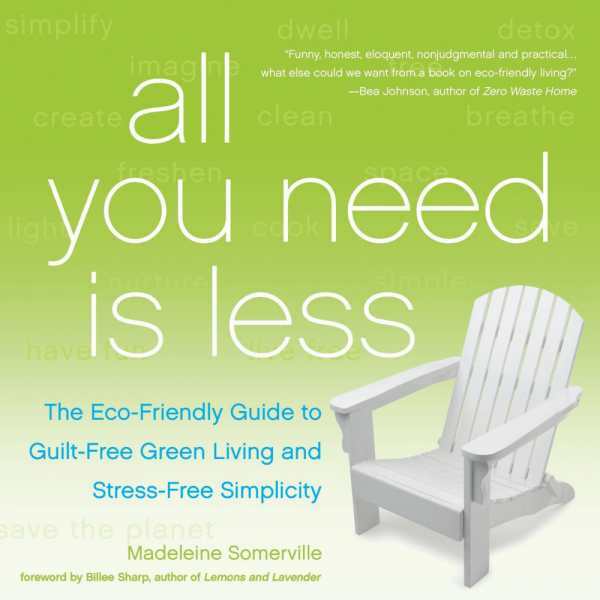 Madeleine Somerville’s All You Need Is Less brings practical tips to the “lazy environmentalist” in search of ideas that move beyond familiar practices (such as curbside recycling and carrying reusable shopping bags). This do-it-yourself guide encourages novices to step toward a simpler lifestyle by reducing consumption, reusing, and making everyday items at home. An energetic tone that doesn’t shy away from occasional expletives and broad humor infuses the topic with panache. With a reluctant audience in mind, Somerville keeps preaching to a minimum. Rather than focusing on negative statistics and various hazards that can make listeners feel “powerless,” she highlights how green movements “can foster a powerful sense of self-reliance.” As such, All You Need Is Less takes a hands-on approach. Topics include recipes for green cleaning products and cosmetics, the value of buying durable goods instead of easily broken plastic, aspects of minimalism, kitchen stewardship, health, gardening, and exploring alternatives when it comes to baby items and pet care. The wide range is not intended to overwhelm. Somerville remarks, “For many people, being eco-friendly has become just another source of inadequacy, one more thing to feel guilty for not doing, and that’s really not what it should be about.” She also notes that it’s okay to begin one step at a time. The message to embark on the path of natural living—both for its smaller carbon footprint and for its ability to reduce stress—is worthy, if sometimes couched between exclamatory asides (“dun dun dun dunnnnnn!”), tangents (“anyway, I’m going to stop talking about this, because I can move on”), and generalized commentary (“marketing execs know all too well that we human beings are weak, and, much like crows or monkeys, we are easily seduced by anything shiny and new”). Somerville acknowledges that for many people, foregoing convenience seems burdensome. She playfully notes the benefits of increased exercise that come from doing more for oneself, and refreshingly, she understands the hesitation and personal limits that may lead those starting out to eschew one tip while accepting another. The book may not convince the most recalcitrant, yet the winking manner in which chores are viewed does turn them into a doable, adventuresome challenge. With its specific brand of hip narration and honest pragmatism, All You Need is Less provides an unusual and helpful overview.